Mother's Day is quite a big thing in my family. I'm talking about flowers, chocolates and my mum getting to do whatever she wants all day, but she's encouraged to just sit and put her feet up. We usually make a full roast dinner to celebrate (without her help, of course), which usually goes down a storm! I'll be honest though, I can't remember the last time I gave my mum breakfast in bed - terrible, I know - so when the people over at Blinds Hut asked me to create a breakfast recipe for the Queen in my life, I was a little bit stuck. After a lot of thinking and researching, I think I came up with the perfect bake! 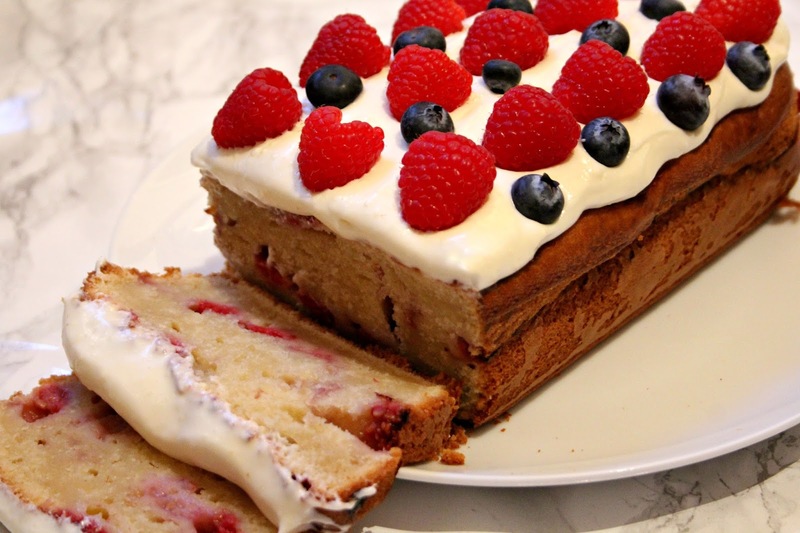 This is my raspberry and white chocolate cheesecake loaf, and I know what you're thinking.. "Olivia, cake for breakfast? Have you officially lost it?" Listen, if your mum can't have cake for breakfast on Mother's Day, then when can she? Not only does it make an amazing breakfast with a piping hot cup of tea, it can also be eaten as dessert, so really, it's a winner! By looking at the image above, you can probably tell where the raspberry comes into the equation. We've got homemade raspberry sauce running through the loaf and it's topped off by even more raspberries, but what about the white chocolate and the cheesecake? Well, you see that white cream that's smothered over the top? That's pure, unadulterated white chocolate cream cheese frosting and let me tell you, it's to die for! Not only that, but I also added cream cheese to the loaf batter which makes the cake super moist and just gives it that extra bit of edge. It's a mixture between a sponge cake and a cheesecake, and while that sounds bizarre, it works perfectly. To make your sauce, heat the caster sugar and 170g of raspberries in a small saucepan over a low heat. Roughly mash the raspberries with a spatula or fork, being sure to leave some fairly whole, and mix together until the sugar has dissolved. This should only take 2-3 minutes. Turn off the heat and set the pan to one side to cool. Preheat your oven to 180c, and grease and line an 8x4" loaf tin (or a standard pound cake tin). Sift the flour, baking powder and salt into a medium sized bowl. Set to one side whilst you cream the butter, cream cheese and sugar in a large bowl until they become light and fluffy. Add the eggs into the wet ingredient mixture, beating thoroughly after each one. Then add in half the flour mixture and half of the milk. Gently fold them in, then add the remaining flour and milk before folding again. Once it's all combined, pour half the batter into your prepared tin. Using half of the raspberry sauce, add blobs on to the batter, then swirl them through with a knife. Pour in the remaining batter, followed by more raspberry sauce. Swirl this through with a knife before tapping the tin gently on the countertop several times. Pop the cake into the over and bake for around an hour or until a skewer inserted into the centre comes out clean. If you find that your cake has developed a good crust but the inside needs longer to bake, cover the top in foil and pop it back into the oven. Make sure to check it regularly, otherwise you'll end up with a dry cake! Once baked, remove from the oven and allow it to cool in the tin for 10 minutes, then transfer on to a wire rack to cool completely. Whilst the cake is cooling, you can get started on making the topping. Melt your white chocolate in a heatproof bowl over a pan of barely simmering water. Stir until smooth, then remove from the heat and allow it to cool slightly. In a large bowl, beat together the cream cheese and butter. Mix in your cooled white chocolate and beat until gorgeously smooth, then gradually beat in the icing sugar. I didn't use too much icing sugar, as I wanted my topping to be fairly creamy and more runny than a buttercream, but if you'd like your topping to be thicker, add more icing sugar. Once your cake has cooled, spoon over a generous helping of your icing and smooth it out with the back of a tablespoon. Top it off with more raspberries and blueberries - of course, you don't have to be as neat as I was. I actually wanted to be quite messy with it, but my need for straight lines totally took over! While this isn't just two slices of toast and a cup of tea, the effort you put in to create this breakfast will be massively appreciated, especially if it's served in bed. It's ideal with a splash of cream or if you're mum's feeling extra luxurious, a good scoop of vanilla ice cream. This year, Mother's Day falls on the 26th of this month, so if you haven't started planning yet, you best get your skates on! I had a lot of fun creating this recipe, so thank you to Blinds Hut for inviting me to get involved with this project! Perfect for Mother's Day. This Queen would love it.